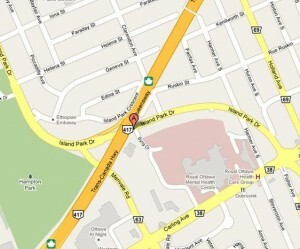 Do you have questions about what we do, where we are located or want to rent space at this location? Please email all inquiries to Kirsten Gracequist at kgracequist@kitchissippiuc.com – she will get you the information you need! HOW TO FIND US! We are loacted behind the Royal Ottawa Hospital and across the street Wesgate Shopping Centre at Merivale Road and Carling Avenue. Still not sure? Call us 613-722-7254. Plenty of accessible parking. Our building and washrooms are also wheelchair accessible. OC Transpo bus #85, 86 or 80 http://www.octranspo.com/routes.